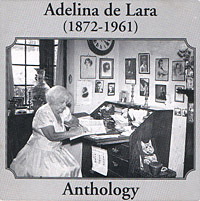 Adelina de Lara - was born in Carlisle on 23 January 1872 and was thus 89 when she died in Woking on 25 November 1961. Educated in Frankfurt she studied the piano with Fanny Davies (1885) and Clara Schumann (1886-91) and during her studies became close friends with Johannes Brahms. Her debut took place at the St James Hall in 1891 and she played in public for over sixty years thereafter. As an example, she played the Schumann Concerto with the Hallé Orchestra in 1897 and broadcast it in 1945. 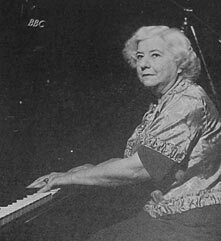 She played at the National Gallery for Myra Hess during the Second War, organised War Fund concerts in both wars and broadcast frequently, appearing on BBC television on her 82nd birthday. She was awarded the OBE in 1951 and was also able to proudly count Sir Adrian Boult and Queen Elizabeth the Queen Mother amongst her friends. She recorded copiously, mainly Schumann, and published her autobiography Finale in 1955. Her compositions included many ballads, two song cycles, much for piano including two concertos and two suites for string orchestra, including 'In The Forest'.